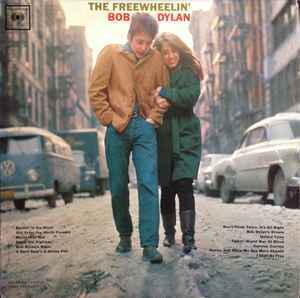 Printed By – Modern Album Finishing Co.
First commercial mono pressing with red "2-Eye" Guaranteed High Fidelity labels and pressing plant / rear cover variation to The Freewheelin' Bob Dylan. This version was pressed by Columbia's plant in Terre Haute, Indiana [identified by T and o in runout / dead wax]. - 3 on bottom right corner (indicating Modern Album Finishing Co. per Searching for a Gem. - Some have side A runout etched, side B stamped. All first mono releases have GUARANTEED HIGH FIDELITY on labels.